Nearly three years after devastating earthquakes that destroyed thousands of private homes and public properties, and two years after formation of the National Reconstruction Authority (NRA), hundreds and thousands of earthquake survivors are still languishing under temporary shelters. Why such insensitivity? What are the problems? What is NRA actually doing? 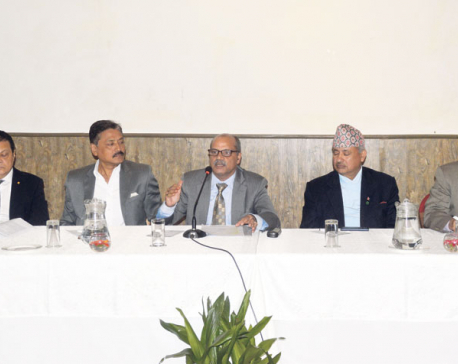 Mahabir Paudyal and Sagar Ghimire talked to Yubaraj Bhusal, Chief Executive Officer of NRA, who completed his 100 days in office on Wednesday. Only 11 percent of private houses have been rebuilt so far. What is NRA doing? Immediately after the earthquakes, the government sprang into action. Post-Disaster Needs Assessment (PDNA) was conducted immediately. Post-Disaster Recovery Framework (PDRF) study was conducted. Donor conference was held to generate funds for reconstruction. Donors pledged over four billion dollars. Then NRA was constituted. 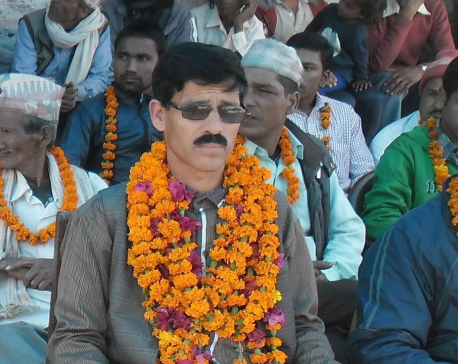 The first CEO Govinda Raj Pokharel and his successor Sushil Gyewali laid the foundation work for reconstruction. When the new government took over, I was appointed the CEO. This frequent change in leadership may have created the impression that NRA itself is not doing the job well. But that’s not actually the case. Why such frustrating delays in reconstruction? Since rebuilding private homes is a major concern now, let me start with this. A total of 767,705 private households were recognized as beneficiaries of reconstruction grants. Around 2,700 technicians were appointed and mobilized on the ground to expedite reconstruction works. They were posted to the district-based office of urban development and building construction. They were supposed to be deployed in villages, which lacked proper accommodation facilities in the immediate aftermath of earthquakes. Most engineers who come from urban base found it difficult to work under those conditions. They stayed at the headquarters. There was equal amount of allowance of 75 percent for all technicians irrespective of whether they worked in the villages or stayed in headquarters. By the time earthquake, survivors started building houses; around 1,100 of technicians quit their job. When the survivors needed engineers they were not available. We had to call for applications again. Around 4,200 applied for the job. I then started a new provision of training selected engineers before deploying them on the ground because many of them were still not familiar with building codes and building patterns in rural villages. Very few participated in the training. Of those who were trained, many demanded to be posted in Kathmandu or to other urban centers. Few were ready to go to remote villages. I devised different incentives for those working in very remote parts and those working in cities and towns. At the moment, we don’t have enough technicians on the ground but many more are working than in the past. So the first reason of the delay is the lack of technical manpower and lack of willingness on their part to work in rural areas. Then there is the lack of masons and carpenters. Around 56,000 people were trained on masonry and carpentry in the last two and half years but most of them either left the country for foreign employment or would not be able to go far away from their home to work in other villages. We had to train many more people again. But survivors complain that they have not been able to reconstruct houses because they have not received reconstruction grants. In financial agreement we had with the World Bank and other donors, it was agreed that grants would be provided in three installments. The survivor would be entitled to first tranche of Rs 50,000 right after being listed as a beneficiary. Once the victim started building a house up to the plinth level and if the engineer certified it, the household would be entitled to receive second tranche of Rs 150,000. When the victim builds the house up to roofing level abiding by set standards, he would get the remaining grants of Rs 100,000. Grants distribution takes long because of other reason as well. Once the construction starts, the engineer deployed at the ward level goes for inspection to certify it. He then sends the file to district urban development and building construction office, where the file is scrutinized and then sent to district coordination committee. When the committee approves, the file is forwarded to the Financial General Comptroller Office, which secures entry of grants in bank accounts of the victims and forwards checks to the banks. Banks take time to complete the process again. This is why distribution is delayed. If the process is so long and complicated, what has NRA done to simplify it? I tried to set a new provision whereby engineers at the ward level certify the process, engineer at municipality or rural municipality approves it and then the respective local bodies recommend the Financial General Comptroller Office to release the money. Donors have not agreed with this provision. But then there are some victims who would not be able to build their houses even if you provide them millions in grants. This is because some of them are either disabled, single women or elderly parents whose children are not staying with them. They are not aware of these processes. We have recently brought a working procedure to provide an alternative arrangement for those who are vulnerable and are not capable of building houses on their own. We are collecting the data about such victims through the Ministry of Federal Affairs and Local Development. After the working procedure is approved by the cabinet, we will enforce new arrangement. If organizations like Red Cross or Dhurmus Suntali Foundation show interest, we will provide them the grants of the victims and ask them to build houses for vulnerable people. But the problem is that even those who are capable of rebuilding their houses are not doing so. They are those who listed their names as the beneficiaries for housing grants but who still have comfortable houses to live in. They have received the first tranche of grants but are sitting idle. What action will NRA and government take against them? First, we will encourage them to build the houses. If they don’t, it will mean that they are the fraudulent beneficiaries. We will recover that fund. We will write to the Land Revenue Offices and District Administration Offices to recover that fund. Action will be taken against those who have pocketed the grant money but not built the houses. It’s better for them to return the fund before the government starts action. Also, there is a category of beneficiaries who completed their houses on their own but have not met the set standard. Around 20,000 to 25,000 houses have been built that way. We will provide correction manual to those households and ask them to make the necessary changes so as to be eligible to receive remaining grants. What about the fund? Do we have enough money to provide money to the beneficiaries? There is no shortage of money for the current fiscal year. We have got a budget of Rs 53 billion for the current fiscal year and because of this grant distribution and construction of houses have sped up. For example, 95,000 houses have been built while the construction of 283,000 houses is underway. To meet our 60 percent target, 450,000 houses should be built. We will need a lot of money to distribute grants to all of these beneficiaries. We have drawn the attention of Ministry of Finance to release Rs 50 billion by mid-March and Rs 100 billion within the current fiscal year. The government recently announced additional Rs 100,000 as housing grants. Can we afford that? I only came to know about this through the media. We have not received it in writing so I cannot comment on it. Even if this decision is formalized, it won’t be possible to provide the amount this year. This additional grant has not been allocated in the budget for the current fiscal year. We take the responsibility of Rs 300,000 which is already decided and funded through the budget. Reconstruction of heritage buildings is equally slow. Why? There was dispute on rebuilding of Durbar High School. We have resolved it now. 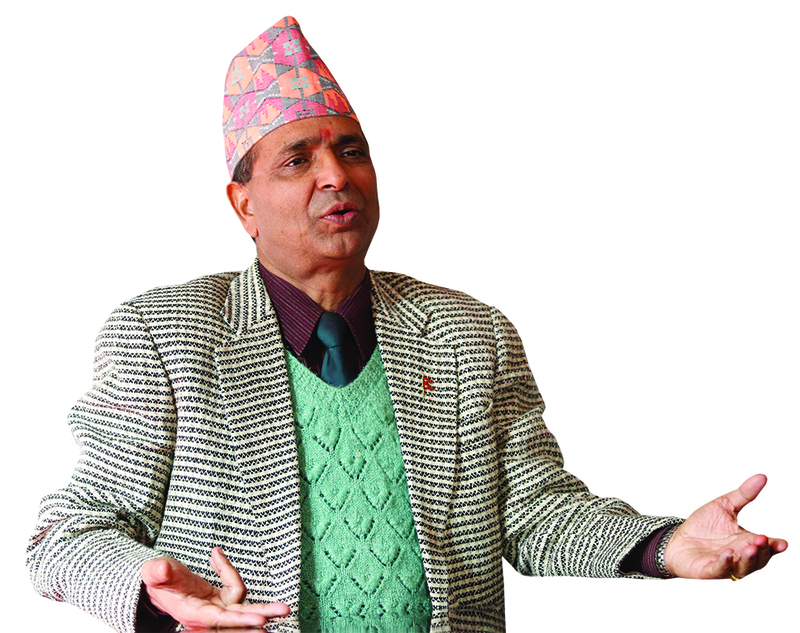 Dharahara reconstruction is in limbo because Nepal Doorsanchar Company abandoned the project. We are now planning to build Dharahara ourselves. We are finalizing cost estimate and design for this. We will start reconstruction within this year and complete it in three years. For rebuilding of Kasthamandap, we will call a meeting to find a way to end the current dispute. There were also talks of relocating vulnerable settlements. What is the progress? We studied nearly 893 settlements of which 190 need to be relocated. If an individual wants to relocate himself, we provide Rs 200,000 to purchase land to build the house, apart from the housing grant of Rs 300,000. For the relocation of big settlements, we need to plan and build infrastructures accordingly. Over four billion dollars was pledged at the donor conference in 2015. How much of it has been realized? The Ministry of Education says it is short of Rs 50 to 85 billion. A total of Rs 196 billion is going to come from the government. Out of Rs 196 billion, 100 billion is to come from the Indian government. India is going to provide Rs 75 billion in line of credit and Rs 25 billion in grants. NRA is nudging India to provide the pledged assistance. For the line of credit, our team recently visited India to finalize the agreement. We can manage money for the current fiscal year from the Rs 196 billion fund but we will likely to face shortage of fund next year. So, we are discussing about holding another donor conference. The reconstruction of damages caused by floods has also been assigned to NRA. Our estimate for recovery cost from flood stands at Rs 73 billion which is likely to increase when more victims come to report the damages. Nearly Rs 100 billion is going to be needed for the reconstruction from flood. We are planning to organize another donor conference in December 2018. Like your predecessor, you are also a political appointee. What if the new government replaces you? Changing CEO frequently will definitely impact our reconstruction efforts. The new leadership takes time to understand the details of the process. If the leadership is chosen from outside of bureaucracy background it will be even more difficult for the new leader to mobilize the officials and get works done. If the new prime minister does not feel comfortable working with me, I will resign. I won’t file a case against the decision. I am not worried about my post and my focus right now to expedite the reconstruction.